In the appropriate cell type and at the correct developmental stage, ribonucleic acid (RNA) polymerase transcribes an RNA copy of a gene, the primary transcript. However, the primary transcript may contain many more nucleotides than are needed to create the intended protein. In addition, the primary transcript is vulnerable to breakdown by RNA-degrading enzymes. Before the primary transcript can be used to guide protein synthesis, it must be processed into a mature transcript, called messenger RNA (mRNA). This is especially true in eukaryotic cells . Processing events include protection of both ends of the transcript and removal of intervening nonprotein-coding regions. On an RNA molecule, the end formed earliest is known as the 5 (5-prime) end, whereas the trailing end is the 3 end. The ends of the primary transcript are particularly susceptible to a class of degradative enzymes called exonucleases. During processing, the 5 end of the primary transcript is protected against the effects of these enzymes by the addition of a CAP. The CAP uses an unusual linkage between nucleotides. Exonucleases do not recognize this unusual structure and therefore cannot remove the CAP. Since exonucleases work only from an end, if the CAP nucleotide cannot be removed, the entire 5 end of the mRNA is protected. The 5 CAP also aids in transport out of the nucleus and helps bind the mRNA to the ribosome . Stages in the processing of an mRNA transcribed from a gene of a eukaryote. 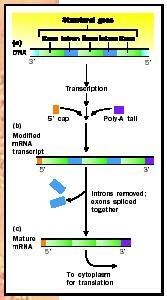 (a) Genetic data are transcribed into an RNA copy. (b) The copy is modified with a cap at the 5 end and a poly-A tail at the 3 end. (c) The exons are spliced together. The mature mRNA then passes to the cytoplasm, where it is translated into protein. residues are degraded. It actually takes quite some time for the poly-A tail to be completely lost, and during this time the protein coding portion of the mRNA remains intact. Without the poly-A tail, however, the exonucleases would rapidly degrade into the protein coding portion of the mRNA. An exception to the poly-A strategy is seen in the mRNA for histones, proteins that wrap deoxyribonucleic acid (DNA) into chromosomes. Instead of poly-A, histone mRNA uses a much smaller structure that is regulated by factors present during DNA synthesis. The most striking event in RNA processing occurs because the protein coding region in eukaryotic genes is not continuous. A typical eukaryotic gene is composed of a number of protein coding regions, called exons, that are separated by noncoding regions called introns. In fact, the number of nucleotides in the introns can be much larger than the number of nucleotides in the combined exons. The DNA gene contains the code for both the exons and the introns, as does the primary RNA transcript, but the noncoding intron sequences must be removed to form the mRNA before protein synthesis. The process by which introns are removed and exons are joined to one another is called RNA splicing, and it is catalyzed by complexes of proteins and RNA called SNuRPs (small nuclear ribonucleoprotein particles). These complexes locate special RNA sequences that flank the exon/intron junctions, bind to them, and catalyze the splicing reactions. Some primary transcripts can be spliced in a few different ways. Such "alternate splicing" yields a range of related proteins. After addition of the CAP to the 5 end, the poly-A tail to the 3 end, and splicing of the introns, the processing is complete and the mRNA is transported through nuclear pores to the cytoplasm of the eukaryotic cell where translation (protein synthesis) will occur. β-thalassemia, a hemoglobin disease, can be caused by an intron mutation that prevents recognition of a splice site.